The Rane DJ Twelve is a simple, pure and powerful motorized DJ control system without the hassle of fragile needles and skipping tonearms. With an all-metal body, the Twelve is built like a tank and it is truly battle-ready. 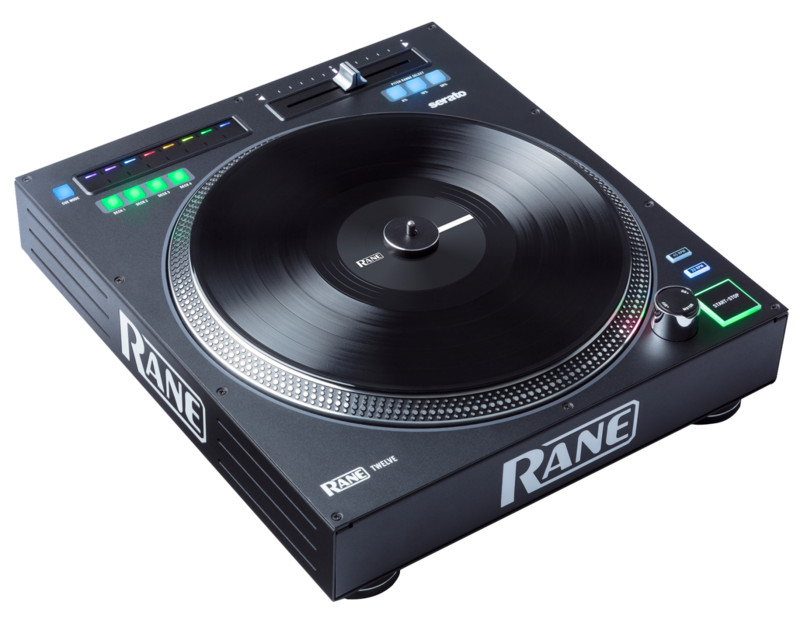 This article will answer popular questions about the features and functionality of the Rane DJ Twelve. What version of Serato DJ is needed to use with the Rane DJ Twelve? Can I use the Rane DJ Twelve with a different mixer or controller? How is the Rane DJ Twelve different from using a turntable and DVS? Can I replace the vinyl and slip mat on the Rane DJ Twelve? When I install the vinyl on the platter it looks warped. Is this correct? The backspin is too tight. Can I adjust this? How many Rane DJ Twelve’s can I connect at once? Does the Rane DJ Twelve have any audio outputs or inputs? Is the Rane DJ Twelve compatible with another DJ software? Is there a way to adjust the start and stop time on the Rane DJ Twelve? What is the touch strip used for on the Rane DJ Twelve? Can I adjust the motor torque on the Rane DJ Twelve? Why are the deck buttons flashing? I assigned the Twelve to the wrong deck. How can I switch? Can I get a power down effect out of the Twelve? What are the dimensions and weight of the Rane DJ Twelve? Why is the pitch fader at the top? The Rane DJ Twelve will require Serato DJ Pro 2.0 or higher, and a Serato DJ Pro enabled mixer or controller with enough channels. The Rane DJ Twelve is an official Serato DJ Pro accessory that enhances your existing Serato DJ Pro setup. The Twelve can be connected with any Serato DJ Pro-enabled device (mixer or controller) with enough channels. The Rane DJ Twelve uses a steady stream of MIDI data to control Serato, as opposed to a timecode signal sent through a stylus/tonearm. This means that the Twelve is not subject to the common feedback and needle jumping from heavy bass and noise in club environments. So, you can crank up the volume and be confident that your signal will remain strong and uninterrupted. Yes. The vinyl can be user replaced and customized by attaching the spindle lock adapter to your own modified vinyl. Three holes (6 mm) will need to be made in the new vinyl in order to attach it to the platter. The included vinyl should be used as a reference. A 2mm allen-wrench is included in the box to remove/re-attach the 45 adapter that keeps the vinyl in place and connected to the spindle. This usually indicates that the vinyl record was not installed properly. The 2mm hex screw on the 45 adapter will need to line up with the cavity on the spindle so that the record can spin along with the spindle. When not lined up properly, the record may appear warped or crooked and may not control the software properly. Aside from swapping out the slipmat like most DJs will do with a standard turntable, the TWELVE allows you to control the feel of the record by simply adding or removing pressure when installing the vinyl record. You can connect up to (4) four Twelve’s to your computer as long as you are using a four-channel mixer, Serato DJ Pro-enabled device and have four available USB ports on your computer. If you are using a two-channel mixer such as the Rane DJ Seventy-Two, only two Twelve controllers can be connected and only the first 2 channels will be available for selection. No. The Twelve is an all MIDI Serato accessory. The audio will be routed through your Serato DJ mixer, interface or controller. The Twelve was developed and mapped to create the best possible out-of-the-box experience with the included Serato DJ Pro software. However, since Twelve’s hardware controls appear to your computer as a generic MIDI device, it can be custom-mapped to any other DJ application that supports user or developer-created custom mapping. Note: Traktor does not currently support motorized platters. The start and stop time can be adjusted within the Serato DJ Pro software. The touch strip is a virtual needle-drop control that enables you to search within a track with ease simply by pointing your finger on a specific part of the strip. The touch strip on the Twelve also doubles as the 8 hot-cue-triggers with the ability to add and delete a specific cue. Yes. Behind the Twelve, there is a Torque Motor switch with a HIGH and LOW setting. At the HIGH setting, the platter will have the heavier, stronger feeling of “modern” turntables. At the LOW setting, it is lighter and more graceful—the feel of a “classic” turntable. The Deck Select buttons on the Twelve will flash when they are waiting to be assigned to a deck in Serato. Press one of the Deck Select buttons on the Twelve to assign it to a deck. Deck availability (2 or 4 decks) will depend on the mixer being used. For example, the RANE Seventy-Two can host up to 2 decks and the RANE Sixty-Four can host up to 4 decks. When in use with a 4-deck mixer, one Twelve can be assigned to any of the 4 decks by using the deck buttons on the turntable. Once the Twelve has been assigned to a deck, it can be switched by holding down one of the Deck Select buttons on any connected Twelve for around 3-5 seconds. The button will begin flashing and all connected Twelve controllers will be ready to re-assign. If another Twelve is already assigned to the deck, that controller will need to be assigned to another deck before that deck can be selected by another Twelve. Yes! The platter on the Twelve will continue to send MIDI data, even when the motor is off. So, to achieve a power-down effect, simply power off the motor and this will create the effect of a needle on a platter spinning down. The pitch fader was placed at the top to make the default layout the classic "battle-style" position. With a regular turntable (pitch fader on the right), DJs would rotate the turntable 90 degrees until the pitch fader and tonearm were on the top in order to keep the tonearm out of the way when scratching. If you prefer the classic turntable layout (pitch on the right, play on the left), the Twelve can be rotated into this position with no detriment to performance. Whether you are a customer or dealer, if you already own a Rane Professional product, or if you just have pre-sales questions, the Rane Professional technical support team is available to help!